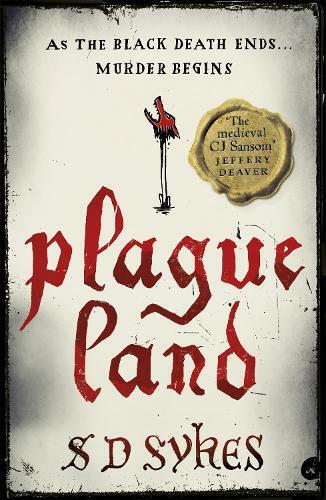 England, 1350: the Black Death has changed the country forever, taking master and servant alike. Young Oswald de Lacey was never meant to be Lord of Somershill Manor, but when his father and older brothers die of the Plague, he must return home from the monastery and assume responsibility for an estate ravaged by pestilence. Almost immediately Oswald is confronted with the vicious murder of a young woman, Alison Starvecrow. The village priest claims it is the work of demonic dog-headed men, a theory Oswald rejects as nonsense. But proving this - by finding the real killer - only leads Oswald deeper into a maze of political intrigue, family secrets and violent strife. I was bought a copy of Plague Land, by S.D. Sykes, by a friend who knows how I enjoy well constructed historical novels, and although I hadn't heard of S.D. Sykes before I can highly recommend Plague Land.